Creamfields took over the reins from Tribal Gathering in 1998 and has become an essential fixture in the UK festival calendar. What have been the biggest innovation(s) at the festival over the past couple of years? There have been so many over the last 20 years, but a couple of stand-out landmarks in our journey has been watching the festival grow from a 1 day dance event to a 4 day camping event, this expansion has in turn given us some great opportunities to evolve the show, no more so than with the mammoth line ups we can book featuring multi genre stages, but also our increasing investment into the production and stages, for example the Steel Yard superstructure which we designed and unveiled last year, after 12 months of planning and taking nearly 2 weeks to build seeing it in action was a great moment. You’ve announced yet another amazing line up this year. How long do artist negotiations usually take and do you always get your first choice? Curating a line up running across 4 days, multi genre stages and featuring around 300 acts is no easy task, a lot of thought, time, money and effort goes into it, ultimately we have our wish list, discussions of which start well over 18 months in advance. How long does it usually take to prepare the site? It’s an all year round job in terms of ground preparation, however, in terms of site, its usually a 2 week build. Your fairground rides are always really popular. Do you have any cool new attractions lined up for this year? We do, but you’ll just have to wait and see! Tents get sweaty at night and keeping hydrated is really important. Do you guys offer free water? 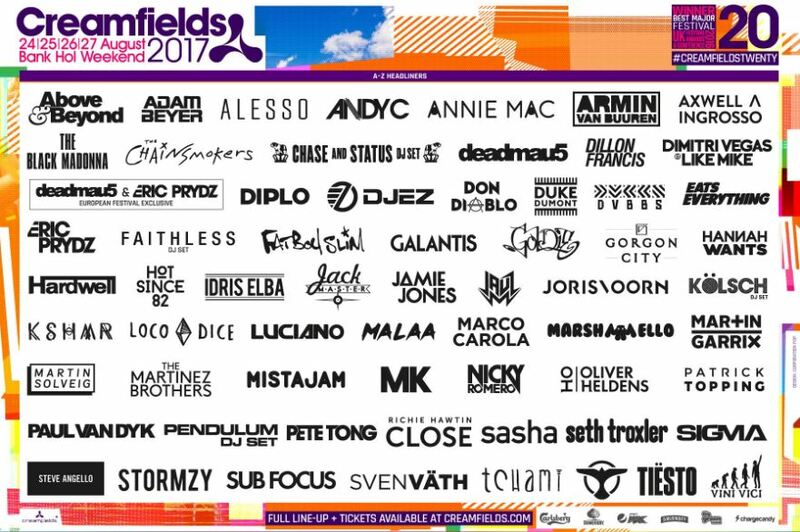 Can you tell something interesting that we didn’t know about Creamfields? Creamfields is located in Daresbury, the birthplace of Lewis Carroll, the forest which forms part of the site is supposedly the inspiration for the much loved children’s book Alice In Wonderland. Dance music culture has become mainstream, which means there are fewer opportunities for new talent to break through. Do you have any plans to create an arena that focuses on new and up and coming talent? Bringing through fresh talent is something we’ve always prided ourselves in, and over the years have seen so many of those ‘upcoming DJs’ become the next ‘superstar DJ’. It’s important the new breed have a platform and we have an array of emerging new talent performing across all the stages alongside some of their heroes.